Old people eat dumplings. Babies eat dumplings. Big people, little people, smart people, silly people, black, white, Asian, Hispanic—all people eat dumplings. It’s a phenomenon that I experienced early on, when my mom brought pork and chive potstickers for the elementary school “bake” sale. Everyone—teachers, parents, kids—ate them with gusto. 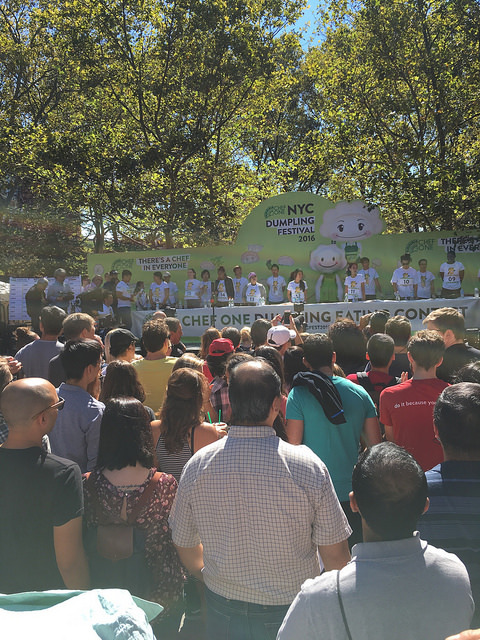 “Dumplings are magical,” said a judge/organizer for the 13th Annual NYC Dumpling Festival last Saturday in Sara D. Roosevelt Park. That’s all there is to it. 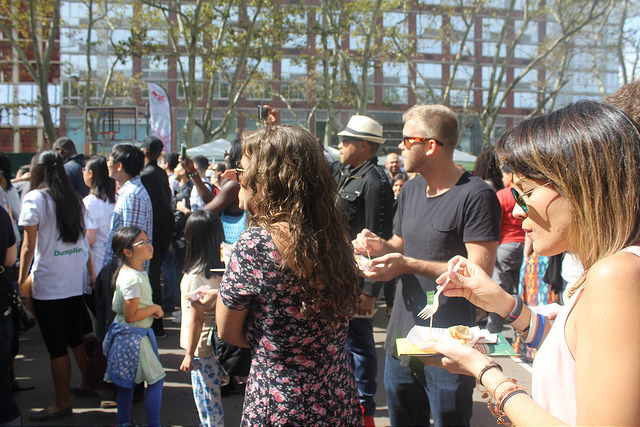 Throughout the festival, swarms of people lined up for creatively titled dumplings from Chef One, the event’s host. There were dumplings with kale, with spicy kungpao chicken, and a dessert dumpling with pumpkin pie-flavored filling. It seems the concept of cultural fusion in dumpling fillings was not missed by the Brooklyn-based dumpling maker, nor home cooks. It was a beautiful day in the Lower East Side to be noshing on dumplings in the park. Fall food festivities were palpable in New York—as I walked by Mulberry Street in Little Italy, just a few blocks away, they were having their annual San Gennaro festival filled with cannoli and fried dough. And as soon as I crossed the Bowery, I began to smell a different type of grease—that of fried, savory dumplings wafting through the street. What I love about the NYC Dumpling Festival is that it’s a walk-in and stay-for-as-long-as-you-like kind of festival—you can get vouchers for as many dumpling stands as you can stomach a large tasting portion from. No entrance fee, no advance tickets or RSVP. There’s plenty of foot traffic along Houston Street, and thanks to the brisk and sunny fall day, I’m sure many people got sucked into taking a detour through Dumplingland as they went about their day. The annual festival also featured music, demonstrations from the Food Bank for NYC (the event’s charitable beneficiary), a dragon dance and more on its stage. 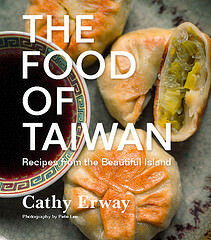 But its main attraction is and has traditionally been its Dumpling Eating Contest. As I mentioned, all kinds of people from all walks of life were at this affair, eating dumplings galore. 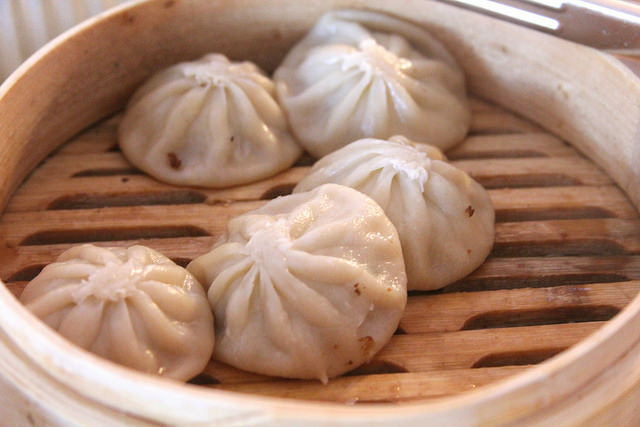 But one person—a woman no less—eats a lot of dumplings, and very fast. 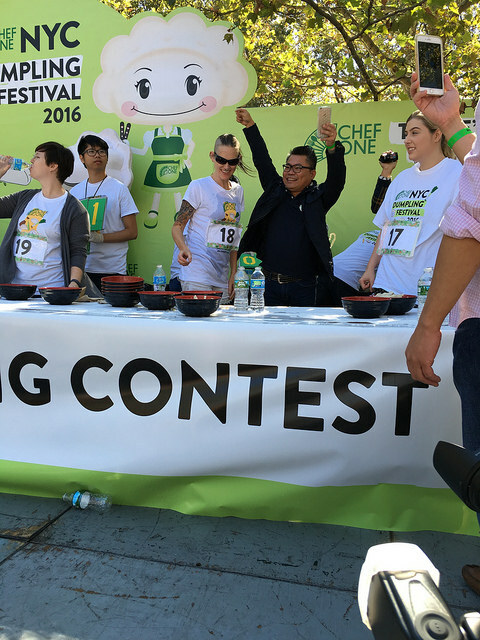 Molly Schuyler, competitive eater, was on site last Saturday to defend her title of reigning NYC Dumpling Eating Contest champ. This woman beat all the men at last year’s competition by eating 93 dumplings in two minutes. This year she smashed her own record by eating almost 20 more in the women’s dumpling eating contest final. When the last-seconds cheering died down and all dumplings were counted, the total number of dumplings that Molly ate in two minutes was 115. The emcees did not have posters with enough numerals for 100+ results. 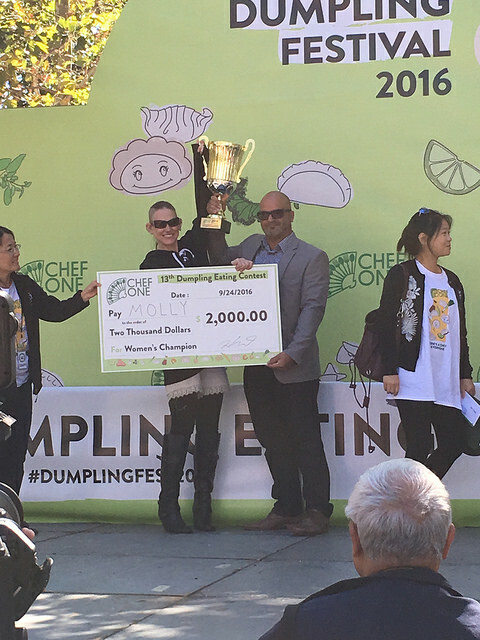 And best of all, Molly Schuyler—the ultimate dumpling-eating champion—continued to eat dumplings at the festival even after she’d completed her record-breaking conquest, while smiling and jumping about celebrating her victory. Molly Schuyler (center, with sunglasses) moments after eating 115 dumplings in 2 minutes. I have never seen anything like this happen with dumplings, or with eating in general, before. But like we already established, dumplings are magical. Maybe they magically evaporated in her intestines. Or maybe they turn people into magical beings. I’m not sure. But when there’s good dumplings, good people, a good cause—and it’s a very good day out, incredible, magical things can happen. Thanks to the 13th Annual Dumpling Festival for letting us find out! The dumpling-eating contest champ accepts her award. This looks wonderful, I’m sad I did not even know about this! everyone does like dumplings i will have to make it out there next year! It is the way that we need to get the robux.